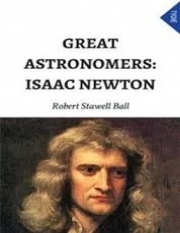 Description of "Great Astronomers: Isaac Newton (eBook)"
This eBook is taken from a chapter in Sir Robert Stawell Ball's Great Astronomers (2nd edition, 1907). Sir Robert Stawell Ball FRS (1 July 1840 – 25 November 1913) was an Irish astronomer who founded the screw theory. He was the son of naturalist Robert Ball and Amelia Gresley Hellicar. He was born in Dublin. Ball worked for Lord Rosse from 1865 to 1867. In 1867 he became Professor of Applied Mathematics at the Royal College of Science in Dublin. There he lectured on mechanics and published an elementary account of the science. In 1874 Ball was appointed Royal Astronomer of Ireland and Andrews Professor of Astronomy in the University of Dublin at Dunsink Observatory. When Ball and the screw theorists speak of screws they no longer mean actual cylindrical objects with helical threads cut into them but the possible motion of any body whatsoever, including that of the screw independently of the nut. Ball's treatise The Theory of Screws (1876) is now in the public domain. His work on screw dynamics earned him in 1879 the Cunningham Medal of the Royal Irish Academy. In 1882 Popular Science Monthly carried his article "A Glimpse through the Corridors of Time". The following year it carried his two-part article on "The Boundaries of Astronomy". Reviews of "Great Astronomers: Isaac Newton (eBook)"